The internet, mainstream media, and Twitter are burning 24/7 with talk of Brexit. I will offer a few thoughts on Brexit at the end of the letter, but I’ll reserve any serious look at the future implications of Britain’s leaving the EU for a later letter, after I’ve had some time for reflection and analysis. I think the implications are every bit as serious as most analysts and commentators suggest, and that means the subject deserves more than reflexive punditry. Instead, I’m going to proceed to give you an updated version of my speech from one month ago at the Strategic Investment Conference. It actually has (as you will see) more relevance today than it did a month ago. We have edited the transcript so that the speech is much shorter and tighter; and of course, going back over it, I came up with a few thoughts here and there that I would like to have inserted in the original. I like this updated version better than the transcript. Like St. Paul, I guess taking the time to organize my thoughts and perform numerous edits does improve my message. And speaking of transcripts, those of you who buy the Virtual Pass to SIC 2016 get the audio versions of the speeches from the Strategic Investment Conference, and you also get the PowerPoints and a complete transcript of each speech and panel, plus a highlights video. That’s a package that’s almost as good as being there. Some people drive to work or have time and prefer to listen to audios. I am one of those who prefers to read. 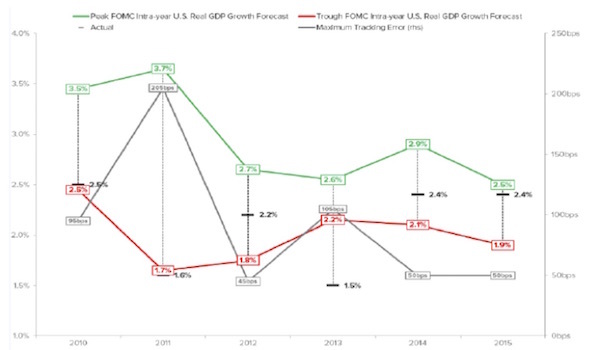 My partners at Mauldin Economics have made it so that you can have it both ways. Plus, there are about 1,000 slides in total. It’s a pretty cool package and well worth the price. You can get the Virtual Pass by clicking here. It will be available for only a short time. Actually, management had already taken it off the website, but I told them that I was uncomfortable with putting my speech there and then not making the other speeches available, so they extended the offer for a limited period. Don’t procrastinate. And now, let’s turn to my speech. As many of you know, I am in the process of writing a book on what the world will look like in 20 years. Much of the book is about exciting new technologies, which I’m convinced will make the world of 2036 far more exciting and wonderful than it is today. Nobody will want to go back to the good old days of 2016. But the potential wealth humanity can create seems to be counterbalanced by the amount of wealth that governments and central banks can destroy. That was an English children’s song from the 1600s and 1700s. Click here to hear it. In ages past, it was traditional for a defeated army to walk through the ranks of the victorious army. It was also traditional for the losing army to play the song of the victors. 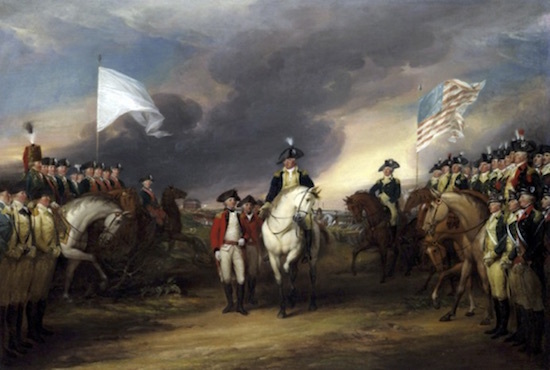 When Cornwallis surrendered for the second time to the Americans, Washington refused to let the British play an American song, so they played the children’s song “When the World Was Turned Upside Down.” At least, that’s what the legends say. In this case, the losing army was twice as big as the winning army. Most military strategists assume that you need an army three times the size of the defending army to attack a well-fortified position. It was unthinkable to the British officers and their soldiers that they could lose. And Cornwallis might have held out, even with heavy losses, had he known that just two weeks later General Clinton and the British Navy would arrive. He would have lost of few thousand soldiers, but the English would have won the war, and the US would now be Australia, albeit much bigger and without Vegemite. Losing was unthinkable to the British, but lose they did; and that is what we are going to talk about today: thinking the unthinkable. If I had come on to this stage four years ago and told you, my friends, that we were going to have 40% of the world’s governmental debt at negative interest rates, $10 trillion on central bank balance sheets, and $10 trillion worth of dollar-denominated emerging-market debt, and that global GDP growth would average only 2%, unemployment would be below 5%, and interest rates would be negative in much of the world and less than 50 basis points in the US, you would have laughed me out of the room. You would have all hit the unsubscribe button. Today’s world was unthinkable a mere four to five years ago. As a futurist, Herman Kahn’s job was to think about the unthinkable. And the unthinkable subject in the 1960s was thermonuclear war. Kahn’s analysis struck a nerve; going beyond consideration of how to prevent a nuclear war, he assessed how the United States could survive and win one. This step proved more than most national defense experts could bring themselves to contemplate. The use of rationalist methods to study an event of such hideous proportions was nothing short of an outrage; in fact, it earned Kahn a place in the annals of film history as the inspiration for the mad title character of Stanley Kubrick’s Dr. Strangelove. Before we can contemplate what might happen in the future, we have to first examine what I think of as a global economic chain with a series of weak links. I am going to argue that there are five major weak links. 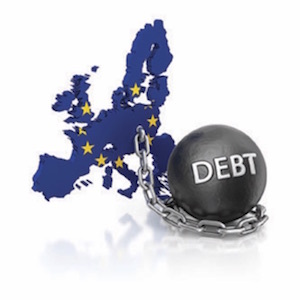 The first weak link is Europe and its debt. On average, across the continent, the debt-to-GDP ratio is about 90%. It is up to 135% and will soon be a 140% in Italy. Either Europe mutualizes all its debt and Germany says, “Ja, vee vill take it,” or the debt problem will continue to worsen. If they mutualize, they can put the debt on the balance sheet of the ECB, and then all the countries of the Eurozone will pinky swear to balance their budgets in the future, giving up their national sovereignty to Brussels. A European treaty is actually what my teenage girls called a pinky swear. They mean it when they sign those treaties, but the problem is actually adhering to the treaty. Today you heard Anatole Kaletsky tell us that Europe’s big problem is unfunded liabilities, and they will have to cut their pensions. Can anybody tell me how loud French pensioners will scream when their pensions are cut? Or what French farmers will get up to when their subsidies are cut? I am suggesting to you that there might be some political problems brewing in Europe. (We will deal with the implications of Brexit and European cohesion at the end of the letter.) So Europe is a weak link – but maybe not the weakest. Remember the Weakest Link TV program? The lady would run through the questions, and then with that sharp British accent, she would say to a contestant, “You are the weakest link,” and the player had to walk off in shame. The weakest link could be Europe, but it could also be China. To succeed, Xi has to rid the Chinese system of endemic corruption and cronyism and build a consumer society. The problem is that you don’t create a consumer society from the top down; you have to do it from the bottom up. I could give you tons of research on that. It’s a basic economic axiom. So, China has problems. Their debt has just ballooned. 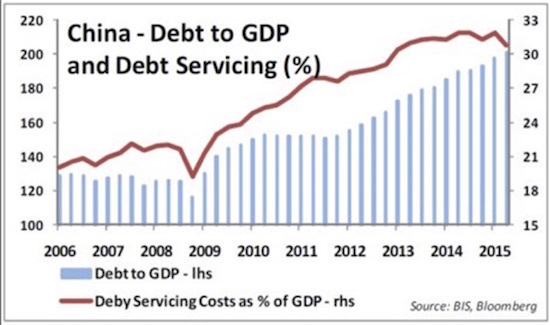 Depending on whom you want to listen to, 40% to 80% of the last $6 trillion the Chinese borrowed went to pay interest on the debt they already had. In less polite circles we would call that a Ponzi scheme. Now, they do have a lot of money. Yes. Can they print more? Yes. Do they want to have a New Silk Road? Do they want to be the world’s reserve currency? Do they want to be the most powerful country in the world? Of course they do. You get into private conversations with Chinese who are hard-core Chinese, and you can see their dreams. Their vision is not unlike the spirit of “Manifest Destiny” that moved the United States westward in the 1800s. We saw ourselves building an empire. The Chinese see themselves rebuilding their own ancient empire. Weak link number three is Japan. I have been talking about Japan for years. The line I coined six years ago is one that everybody tosses around now: “Japan is a bug in search of a windshield.” Japan is doing exactly what I said it would do in my book End Game five years ago and in Code Red over two years ago. It will get honorable mention in the next book. The Japanese have placed 30% of their total government debt on the balance sheet of their central bank. It is going to 70–80% – count on it, says the true believer. That is a lot of yen to put into the system, and that is what I think drives the ultimate valuation of the yen. Emerging markets are the fourth weak link. How do they dig out? They borrowed $10 trillion in dollars that they have to pay back from income earned in their local currencies. Dollar valuation can create serious problems for their debt. And it happens at the worst possible time, during a crisis or global recession when the US dollar is the cleanest dirty shirt in the closet. The value of the dollar will rise at precisely the time when the profits and tax revenues of the emerging-market corporations and countries will fall. Then there is a final weak link – and that is us, the US. We are the most global, powerful, incredible, fabulous country in the history of the world. But here is our problem. 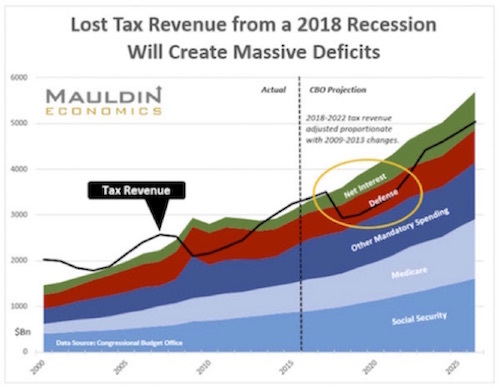 When we next fall into recession, the deficit explodes to $1.3 trillion, even if we lose only the revenue we lost last time. If we have to add in the extra cost of safety nets, it’s $1.5 trillion minimum, plus the almost three quarters of a trillion dollars of “off-balance-sheet” debt. US total debt will be rising at over $2 trillion per year in short order. All in, we are adding $2 trillion plus a year to an already huge total national debt. In five years we could be at $30 trillion debt. We are into 2020 and we are now facing $30 trillion in debt and people are going, “Whoa, what the hell are we doing?” You think there is angst today in the Tea Party? Lacy Hunt is right: debt constrains growth. It constrains nominal GDP; and if we don’t get nominal GDP, we won’t get wage growth; we won’t get the labor participation rate up; we’ll get more of the gig economy; we’ll get a recession where we are back to 8–9–10% unemployment. People are going to be upset. Juan Williams may be right that Clinton is a shoo-in. That may be the best thing that ever happened to Republicans, because she will have to figure out what the heck to do, and she has no clue. Because it doesn’t make any difference which of these links breaks. We are all connected. The whole chain breaks. When it breaks, the result is a global recession every bit as serious as the last one; it’s just different in its causes and effects. But there is a common denominator in each of the weak links mentioned above: Debt. And I do mean debt with a capital D. You can’t just wish debt away or declare a jubilee, because there are banks and pension companies and you and me on the other side of that debt. Somebody owns that debt, and that somebody is you and I in our pensions, in the insurance we buy, in the bond funds in our portfolios, in our foundations, our banks, and corporations. Those bonds silently permeate every part of our lives. Kill them and it all goes pear-shaped. And so then you have to ask the question “WWTFD” – what will the Fed do? Well, I can tell you what I think they are going to do. 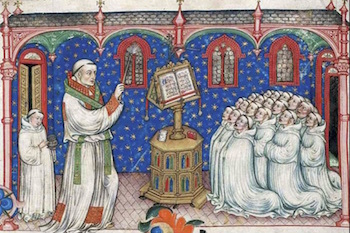 The answer actually takes us back to my seminary days. This is one of the few times my theological education actually informs my economic views. Cornelius Van Til was a Dutch theologian who came over to the United States, went to Princeton, got his PhD, taught at Westminster, and created a philosophical school called presuppositionalism. He said, if I know what your presuppositions are, if I know your true core foundational beliefs, I can tell how you are going to act. I can tell you what your values are; I can tell you who you are. I know how you will ultimately interpret the Scriptures. Your presuppositions determine how you act and work and think in the world. If your presupposition tells you that the Bible says there are four corners of the earth and therefore the earth must be flat, your presupposition is that the world is flat; and so if you sail far enough you will fall off the end of the ocean. So you don’t go exploring. That’s what a presupposition will do. A presupposition does not mean that you’re right, but it’s what you believe. What will the Fed do? They are going to pray. The Fed is not that different, by the way, from the Oral Roberts tent revivals of my youth. How many of you people went to a tent revival? There are a few of us, okay. The rest of you won’t admit it. Oral (or pick your favorite evangelist) would stand there and he would say, “You’ve got to believe!” And you believed. The Federal Reserve is sitting there and they are reading a book by John Maynard Keynes called The General Theory Of Monetary Employment, Interest, and Money. Their core belief, their presupposition, is that consumption is the key driver of the economy. I want to borrow an idea from David Rosenberg, who says that this is not the case. He has made the case that the driver of the economy is income. We were having that discussion in a bar one time, God knows where, and I have never forgotten it. Maybe his explanation squared with my own presuppositions. Because for me, that’s it, that’s the truth: income and production are the drivers; they are the keys. You must have production and entrepreneurship. Keynes was right about animal spirits, but it is not debt and consumption that drive animal spirits; it is profits or at least the potential for profits. Income drives the animal spirits. If I borrow money as an entrepreneur, it is because I think borrowing will help me make more money. So what are these guys going to do? Their economically religious presupposition is that deflation is the worst thing in the world. When you become a central banker, they take you into the back room; they do a DNA swap on you; and you become genetically, viscerally, aggressively opposed to deflation. You do anything you can to make sure deflation never happens on your watch. If that means negative rates, you have to think the unthinkable. If that means more quantitative easing, you keep right at it: you keep printing. That is what is happening in Europe and Japan, and it’s what has happened in the US. Now here is the problem. I am not going to try to take you through this chart, but basically it shows the Fed’s predictions and what really happened. If we go back for the last 100 quarters with their predictions, they are zero for 100. It is statistically impossible to be worse. They have changed their models in three fundamentally different ways over the last 40 years – and, dear gods, every time it made things worse, not better. The Fed has the smartest people in the room, all the PhDs from Stanford and MIT. I have never met a Fed economist who was not ten times smarter than I am. We’ve had some on the stage here. I mean, their credentials are intimidating; they drip knowledge and history. Lacy Hunt is the most intimidating of the former central bankers I know. I love him, but he is intimidating. He remembers every single paper he ever read in his entire life, and he can quote from them ad hoc; and he reads everything, while I read just a little bit. So what is the Fed going to do? They are going to fight deflation, which is a corollary, a by-product of a global recession. 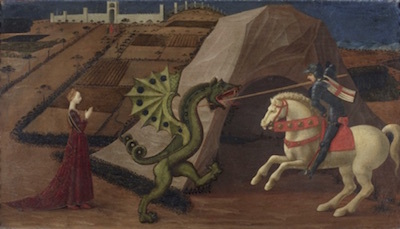 They will see the Dragon of Deflation, and like St. George they will set about to slay that dragon. So will every other central bank. This is not just the Fed; it’s all their fellow central bankers, too. And now we come to thinking the unthinkable. Because, whether we land in a Trump world or in a Clinton world, when the Fed is trying to manage a recession, will the US let the rest of the world devalue against the dollar? No. We are going to have to think the unthinkable: that the government and the central bankers of the world’s reserve currency will actually try to manage the valuation of the dollar down, in ways that will boggle your mind. Quantitative easing and negative rates are just the beginning. Purposely weakening the dollar may be the stupidest idea we have ever heard of, and I am mentioning it to you on this stage because it is unthinkable. Yet it is no more unthinkable than negative rates were four years ago, or having $10 trillion on central bank balance sheets. We get into an unthinkable world, and my mind comes back to the Alamo. Click here and you can hear the “El Deguello.” This was a song that was brought from Spain, and General Santa Anna played it for 13 nights at the Alamo. The translation is roughly “slit throat.” It was the song your bugler played to announce that you would give no quarter to the vanquished. For 13 nights, the men in the Alamo heard this song saying, “We are going to kill you tomorrow,” and for 13 nights 150 men held out against 5000. Eventually they ran out of bullets, and they fought with knives and swords against bullets. They lost. I think that emerging markets are like those beleaguered few trying to hold the Alamo. Emerging-market central banks will eventually lose, too, because they are coming to a gunfight with a knife. How do we avoid such a debacle? We have got to do something with the debt. We may just declare some kind of debt jubilee, which I said above was crazy and unthinkable. But then again, when our backs are to the wall and we are offered a last cigarette and a blindfold, we may start thinking about alternatives. Could we, the major developed countries of the world, all monetize our debts together – not separately, together – and recognize that we all allowed debt to go too far? We have to rationalize the whole system. We need to do it in a coordinated fashion so that no one major country gets an advantage in terms of currency valuation. It’s a controlled currency war. The smaller, emerging markets will be on their own. Sadly, that is my attempt at an optimistic approach to thinking the unthinkable. I have absolutely zero confidence in any idea I have proposed in the last seven minutes. But I am telling you that they are all possible. Central banks and their governments have painted themselves into the mother of all corners, and they are going to paint themselves into more corners because their belief system and their presuppositions are fundamentally wrong. I think they will continue to make the system worse until they have to do something drastic. At that point the only thing they will be able to do collectively is rationalize the debt. One country cannot do that without every country doing it, too. One country doing it alone creates a massive dislocation and a preference for its own currency, which devalues its currency. Without a collective devaluation, we will have currency wars that make the ’30s look like a spring picnic. Back then they were at least devaluing against something: they devalued against gold. Today there is no tether on our currencies. So how then do we invest? The problem we have as investors is that there is nothing we can do except invest in the global markets. That is where we get global growth. That’s it. I had this conversation with Harry Markowitz (the Nobel laureate who developed Modern Portfolio Theory) two months ago. We talked for an hour and a half, discussing MPT and diversifying portfolios; and my argument was that in the future diversifying among asset classes will be futile, because correlations will be going to one in a world turned upside down. In order to actually see performance, I maintained, we have to diversify among the trading strategies that we use to trade the asset classes. You cannot afford to be passive and be long this and short that. That won’t produce results you will be happy with. But if you diversify among smart traders, you have a chance to get your assets from here to the other side. Harry just pointed out that what I was suggesting is still consistent with Modern Portfolio Theory; it’s just a different way of trading diversified asset classes. You really do want to get to the other side of what I see as the coming crisis, too, because on the other side will be one hellacious bull market. Technology is going to take us to places we have never dreamed of. Three billion people are coming into the emerging-market middle classes, even if later rather than sooner. It is going to be a phenomenal world. You have just got to figure out how to get your assets from here to there. Look, the Fed models don’t work. Yet for whatever reason, we somehow continue to accept that the Fed is smart enough to manage the most important price in all the world, the price of money denominated in the world’s reserve currency. Which is to say, they manage interest rates, which is basically the price of money. They do this based upon the models they create, which have never been right. They get nothing else right, and we think they can get interest rates right? They are going to screw it up, which is precisely what they have been doing for the past six years. We are in the beginning stages of the most massive monetary policy mistake in the history of the world, with the possible exceptions of Weimer Germany and Zimbabwe. But the implications are far more global now. I am afraid that the one thing we can count on is that whatever policy the Fed chooses will be the wrong policy. They believe they can set the price of money and thereby balance demand and supply. Can anybody name me one instance where fixed prices worked in the real world, creating a paradise where supply and demand were balanced? They have manipulated the system and set the wrong price of money. They have created a world where savers are penalized, companies are paid to buy their competition rather than compete, and only the participants on Wall Street are rewarded with appreciation of their assets. My Austrian and monetarist economics school friends, who predicted inflation from all the QE that we saw, have actually seen inflation – it has just been in asset prices that benefited Wall Street and not Main Street. And it’s not just a US problem. It’s Europe and Japan and anywhere in the world where interest rates and savers have been repressed. Unless we see the central bankers of the world reevaluate their religious convictions about how monetary policy should be run, we are going to enter yet another period when the unthinkable becomes reality. And to be ready for it, and to potentially profit from it, you need to begin to think the unthinkable today. It is way too early to draw any conclusions about Brexit, other than to talk in terms of general concepts and feelings, which I will briefly offer, but I promise a later letter that will go into the implications of Brexit in far more detail, after my researchers and I have looked at the issues in depth. First, my good friend and fellow writer/thinker Barry Ritholtz reminded me of the wisdom of screenwriter William Goldman, from a century ago, talking about the world in which he lived, that “Nobody knows nothing.” If you think you know how Brexit is going to turn out, you probably have a presupposition that is clouding your thinking. This is unknown territory. There be dragons out there, but we have no idea whether they are good dragons or bad dragons. It depends on which near-future science fiction novel you’re reading. Because economics is getting ready to turn into science fiction. Cameron resigned. Big shock (note sarcasm). I would have done the same, because who on God’s green earth would be so insane as to want to go through the next two years of negotiations with the EU? Talk about a way to age 20 years in the next two – and that will be the new prime minister’s role. Whatever the outcome, nobody will appreciate the work. Cameron is young enough that he can make a comeback if Brexit ends up looking like a bad decision. If it turns out to be a good decision, well, his daddy is rich and his ma is good-lookin’, and he can make a lot of well-paid speeches, sit on a lot of boards, do a lot of consulting, and make a ton of money. There are worse gigs. Ask Tony Blair. Or Bill Clinton. The next prime minister (if and when they can find somebody masochistic enough to take the job) will notify the EU of his or her intentions along about October or November, probably. Then they have two years to negotiate the exit strategy. This is a classic equilibrium-theory, prisoner’s-dilemma situation. The longer the British take to come to an agreement with the EU, the more the other EU members realize they need Britain and its market, not to mention its monetary and banking prowess. But the longer the British take, the more uncertainty there is in the market; so the more problematic the situation becomes for their economy, as businesses have to make a decision about whether to move to Ireland or to the mainland to have unfettered access to EU markets. And the EU would like to immediately punish Britain so that nobody else will want to leave. But then the United Kingdom just stalls, so it really is pointless for the EU to bluster and try to take quick action. But waiting allows those who want to call for referenda in other EU countries to take heart and plunge ahead. What we will end up with is a massive multiplayer Nash equilibrium-theory game, whereby all players try to make their least-bad decisions. I want to make it clear: There are no good decisions that will make everybody happy. This is a divorce, and it’s pretty rare to see both parties to a divorce walk away totally happy. This is not going to be one of those rare instances. This is going to be a very ugly, nasty, brutal, lawyer-riddled, expensive divorce. Which is why I have to think more about the implications of the process before just offering a lot of off-the-top-of-my-head comments. This is a game changer. But it’s just not quite clear yet how the game will be changed. Okay, I see you asking for my reactions. I’m already getting those phone calls and emails. So, my first reaction is that this is the first domino in a series of dominoes that will create more referenda and embolden numerous separatist movements. I saw a poll in which 90% of the Dutch questioned wanted to have their own referendum. I have no idea what that actually means. What happens when Italy decides to conduct a referendum? Polar political opposites like the Lega Norde and the Five-Star Movement (which just captured the Rome mayoralty) would both generally vote for leaving the EU. That might constitute a majority in Italy. God knows what the EU would look like afterwards. Seriously, Brexit might actually precipitate a breakup of the EU before the debt issue can even go critical again. This European situation is actually becoming as interesting as Game of Thrones. Forget the Kardashians, this is Reality with a capital R. Fortunes will be lost and made; every country will have to actually weigh the costs of staying or going – no more kicking the can down the road. Will Germany decide to pick up the costs and debts of the rest of the EU? Will Italy willingly enter into a long-term, deflationary recession, as Greece has done? That is the price they may pay to stay. Do you release the Krakens, otherwise known as the ECB and Draghi, to go after individual country debts to the detriment of Germany and the other northern and more vested nations? Do you actually think the Dutch or the Finns, not to mention the Austrians, will go along with such behavior? And do you think the Belgians, who have been on the verge of breaking up for several decades, can keep their emotions in one piece, just for the kids? Europeans live in interesting times. Finally, Brexit is going to take some time to play out. From my perspective, it is not at all clear what the actual financial implications are. I wanted duly noted that I’m on record as saying many years ago that the pound would go to parity. Ditto for the euro, which I talked about rising to $1.50 in 2003 and falling back to a dollar over a few decades. I think we are on track. Those calls have been better than my Japanese yen call – so far. What does Scotland do? We are already seeing calls from authority figures in both Scotland and Northern Ireland to hold additional referenda on leaving the United Kingdom. I think it makes sense for Northern Ireland to join with their Irish compatriots, which would have them once again back in the EU and allied with the far more prosperous Ireland. Scotland, on the other hand, has to decide if it wants to hop from the frying pan into the fire. If I were a thinking Scot (and are there any other kind? – just ask any Scot you know), I think I might want to see how the dust settles before I decide which way to jump. Those are my personal observations for now. As I think about it, they are fodder for multiple letters. I have to admit that being a writer on economics and finance today is more fun than I would’ve ever possibly imagined. Not that what we’re getting ready to experience is going to be fun, but there’s just so much great material sitting out there in front of you. The writer in me is just salivating. This is a rather magical few days for me. My Brexit party was over the top, since the vote turned out to be a nail biter for the first few hours. Those of you who didn’t tune into the BBC (my daughter had to tell me to get BBC on DirecTV) probably never saw the vote swing back and forth, and every now and then it would be literally 50-50. The conversations were exhilarating with what turned out to be a fascinating party guest list. More on that later. I am off now to Austin to spend a long afternoon, evening, and following day with George and Meredith Friedman. George is in book-writing mode, which means he is manic and isolated. Meredith has declared that he will take a weekend off and invite some odd friends down – and I qualify as odd, though Shane is nothing but middle-of-the-fairway nice, which works very well with Meredith; and the two of them spend the bulk of their time trying to keep George and me in the middle of the road. Not an easy task. But it is not a thankless task, in that George and I are both grateful. We will have a lot to talk about, as we are both deep into working on new books. He is writing about the future of the US; I’m writing about the future of the world. I think we will find a few topics to discuss late into the night. Not to mention our growing business partnership and future plans. I know, I said I’m not planning to leave Dallas until I finish my book; but Mark Skousen talked me into coming to his big libertarian blowout in Vegas, called FreedomFest. Since I’m not really doing a vacation this summer, I thought I could go and moderate a few panels with old friends like Steve Forbes and Rob Arnott. I have tons of friends coming to the conference, and I’ll also do a breakout speech that I’ve have been wanting to do for quite some time but that I know nobody will pay me to do, entitled “The Invisible Hand, Evolution, and Why I Am an Economic Atheist.” It will be a short speech on a topic I have thought about a great deal and am passionate about. Shane and I will catch a few shows (I will once again see the Cirque du Soleil show called “Love,” featuring the music of the Beatles) and spend time with friends. I will even catch some of the other conference speeches and panels. You can see the lengthy list of speakers and topics by going to freedomfest.com. It happens July 13–16 at the Planet Hollywood casino. It is actually a fairly inexpensive conference and venue. I think there will be something like 2,000 attendees, representing all wings of the libertarian world. Trump spoke there last year, and I think Gary Johnson is speaking this year. If you are at the conference, my speech is on a Saturday afternoon, and I would appreciate your dropping by. And if you see me wandering around, walk over and say hello. Post-conference I’ll be back home until the first week of August, when I will head to our annual Maine fishing trip with a bunch of unruly economists. Afterward, I’ll show up in New York for a few days. Then my calendar is travel-free until the middle of September. I talked Neil Howe into staying over one more night and then took him to a restaurant called Javier’s in Dallas. Javier is a good friend, and his restaurant is a staple in the local dining circuit. It is actually Mexican cuisine as opposed to Tex-Mex. On the weekends you can’t get a seat without a reservation unless you want to wait a few hours. Since Javier has somehow arranged to have the only legal cigar bar in all of Dallas, more than a few people have been known to come and wait. The place is usually packed with local celebrities. If you come to Dallas, you should check it out. Ask for Javier’s special margarita. And the panella they make tableside is awesome. Neil and I spent hours chewing over a variety of topics. The breadth of his factual knowledge sometimes just astonishes me. How does someone learn, let alone remember, that much historical trivia? I truly recognize that I am one of the luckiest guys in the world. For whatever reason, I get to hang out and talk with an amazing cast of characters day in and night out, always learning and maybe offering my own humble idea every now and then, just to keep up the pretense that it’s actually a conversation rather than their giving me a lecture. You have to keep up the image, you know? I stayed up and watched the BBC for a few hours after all the guests left, not something I normally do. But I was fascinated by the reactions of the people they were interviewing. You could see the utter shock and dismay of those who were on the Remain side of the vote, and the general quiet determination to move forward on the part of those who were for Leave – well, except for Nigel Farage, who was his typical over-the-top self, declaring June 23 to be England’s new Independence Day. And with that it is time to hit the send button. You have a great week. And if you want to make it really great, click on the next link and listen to a young rock group called the Shelters. My biotech junkie friend Patrick Cox introduced me to them. He is always sending me a link to a new group, most of which I don’t “get.” This group blows me away. June 28, 2016, 6:35 a.m.
John, You discuss government debt but not overall debt. The US government debt is around $19 trillion. The overall US debt, private and public, is around $65 trillion. And you don’t even mention that. Another example of your being a “true believer”. It is also intellectually dishonest. June 27, 2016, 10:23 a.m.
John states that “income and production” are the basic drivers, in opposition to consumption per Keynesians. This is a common perspective for those on his side of the discussion. However, a problem is that production will not occur if the producer does not first discern that there is demand for his product, that is, consumption. This is why Keynesians wish to stir consumption, which will then induce production. Ultimately, I think there is something of a chicken and egg problem here. A producer is not going to produce unless he believes the demand exists for his product. In this sense, Keynesians are right that demand comes first. But, where does the consumer acquire the income that enables him to have demand? Through his production. In this sense, without production there cannot be the income that makes it possible for one to demand, which supports John’s apparent perspective. Yet again though, there will not be production in the first place without demand. It seems to me that both perspectives have a point, and that John is remiss to imply that production will arise absent there first being demand. June 26, 2016, 10:43 p.m. Here is another weak link: Office of the Comptroller of the Currency shows about $200 trillion in derivatives held by US banks. That is trillion with a T. What could possibly go wrong? June 26, 2016, 6:17 p.m.
Me. Mauldin,we continue to talk about how misguided the Fed’s monetary polices have been and how they will continue. We never seem to consider how we, as a country of voters and influencers, might change this process. What is you view regarding the possibility of a change? June 26, 2016, 12:47 p.m.
Hi John. You mentioned unemployment at less than 5% when I know you are aware that the official U3 does not state the true level of joblessness—-the U6 is closer to the truth and according to BLS is 9.4 while Gallup using the same data notes 13.6%; that labor participation rate is at a 38 yr low even adjusting for retirees; that part time jobs have replaced FTEs; and that retirees have found little problem getting menial jobs while millennials and minorities particularly cannot find jobs c/w the past. This is why household income is flat with 80-90% spent on rent, food, insurance and medical which the CPI does not count—-leaving little for PCE or savings by the average household. Stagflation anyone? But the govt and media do not make these facts known because ‘the economy is strong and everything is ok’. June 26, 2016, 10:43 a.m.
June 26, 2016, 7:07 a.m. I campaigned hard to exit the EU. However, like millions of others, next morning I wondered what the heck we had done. I had one sole reason to leave….sovereignty. If the whole EU does break up, I suspect this will the THE issue. As for Scotland, remember the story of Robert the Bruce’s spider…..in essence, ‘If at first you dont succeed, try try again’. This is the Nationalists thinking. They will keep calling referendums until they get the answer they want. But curiously, they will still never achieve independence, only swapping the UK for EU. The only way for them to truly achieve independence is to leave the EU as presently constructed. But something really good may come of this Brexit referendum. Already highly influential people from across many member states, are calling for root and branch reform of the EU. If, they can acknowledge sovereignty and commit to ripping up the Treaty of Rome with its aim of ‘Ever closer political Union’, and return to a fairly simple trade agreement, then I for one would campaign hard to set our referendum result aside. In the forthcoming exit negotiations, the acknowledgement of sovereignty may be all the compromise thats needed. June 26, 2016, 3:26 a.m. I don’t know why ‘currency wars’ is touted so much these days. As you point out, the ‘30s currency war mattered because they used a gold linkage. Today, Sterling devalues against Euro/Yen/USD, Yen then devalues against Sterling/Euro/USD bassis some Japanese move, then Euro devalues against the other 3 on fears of .....exit (fill your choice), then Fed devalues USD against other 3 and we’re back to where we started. Does it matter to anybody? Sure, gold goes up to 3000 USD but then oil is re-priced and so is copper, and silver, and zinc, and…...(rest of list follows). At the end of a circle, it appears to me all values are static relative to each other though the numbers might be different (eg, USD = 1.2 Euro = 1.3 Sterling, etc OR 1 oz of gold still purchases the same quantities of other materials it used to prior to the cycle, though the rates quoted earlier were 900 USD per oz of gold and it is now 9000 USD per oz of gold). When will it matter? If and only if the lenders opt out on a large enough scale. Can that happen? It can. Will it happen? Maybe never? If there are lenders at negative interest rates, the circle can continue, theoretically at least, forever OR long after everybody alive today is dead. June 26, 2016, 12:01 a.m. The character of Dr. Strangelove was based on Dr. Henry Kissenger, not Herbert Khan. June 25, 2016, 11:03 p.m.
Am I the only one who does not know what the federal off-balance-sheet debt consists of? “If we have to add in the extra cost of safety nets, [the deficit is] $1.5 trillion minimum, plus the almost three quarters of a trillion dollars of “off-balance-sheet” debt.” For me please add a one-sentence description of that debt.